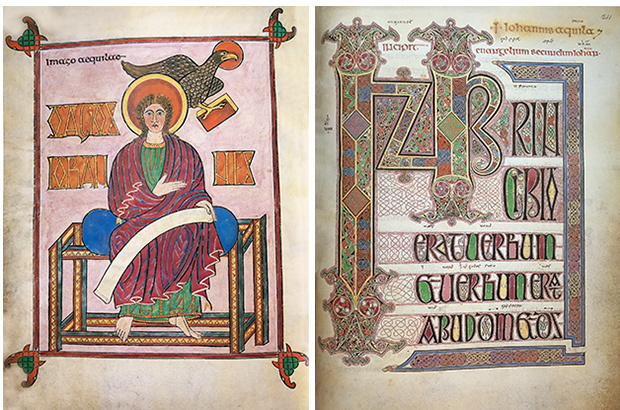 The Lindisfarne Gospels is one of the greatest treasures of the British Library. Dating from the end of the 7th century,(the years immediately before 699) the book is a magnificent work of art, its pages illustrated with breathtaking illumination and elegant Latin calligraphy. 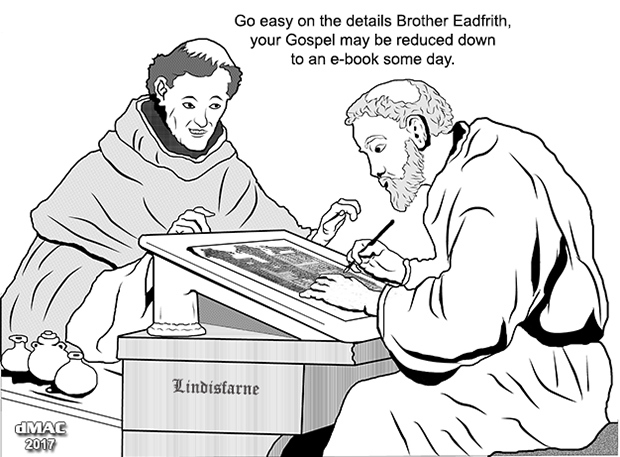 The Book was written and dedicated to St Cuthbert by Eadfrith, Bishop of Lindisfarne (Holy Island, England). Its binding was the work of his successor, Ethelwald. 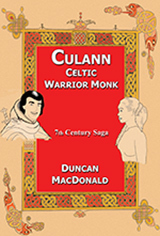 Illustrations contained in this e-book are posted on our web site for your consideration. 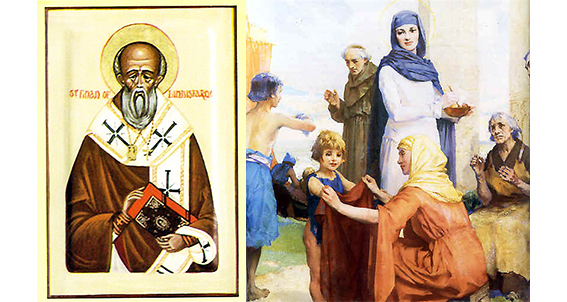 [L] Cross-carpet page introducing Saint Jerom's letter to Pope Damasus. [R] Decorated initial page of Saint Jerom's letter to Pope Damasus. [L] The 3rd in Eadfrith's sequence of arcaded tables. 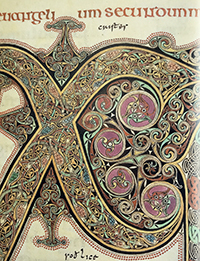 Interlaced birds fill the colums, while simple ribbon knotwork is used on bases & capitals. [R] Full page miniature of Saint Matthew, with his symbol, a winged man blowing a trumpert and carrying a book. Note the mysterious figure behind the curtain, which may be intended to represent Jesus. 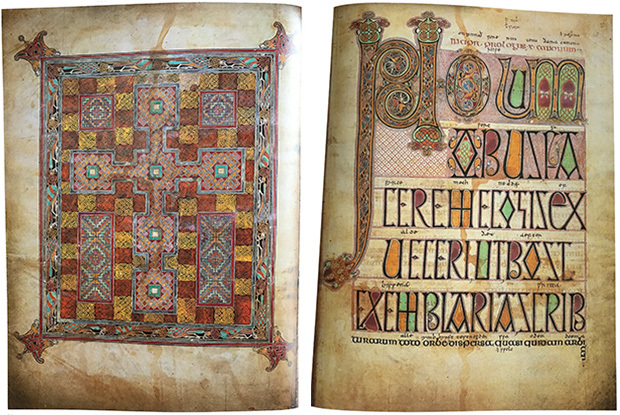 [L] Cross-carpet page introducing Saint Matthew's Gospel. [R] Decorated initial page of Saint Matthew's Gospel. [L] Saint Mark, accompanied by his symbol, a winged lion blowing a trumpet and carrying a book. [R] Decorated initial page of Saint Mark's Gospel. [L] Saint Luke accompamied by his symbol, a winged calf carrying a book. [R] Decorated initial page of Saint Luke's Gospel. [L] Saint John accompanied by his symbol, an eagle carrying a book. 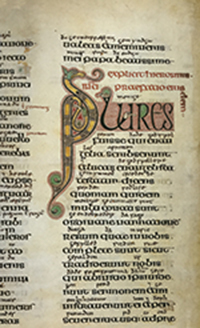 [R] Decorated initial page of Saint John's Gospel. 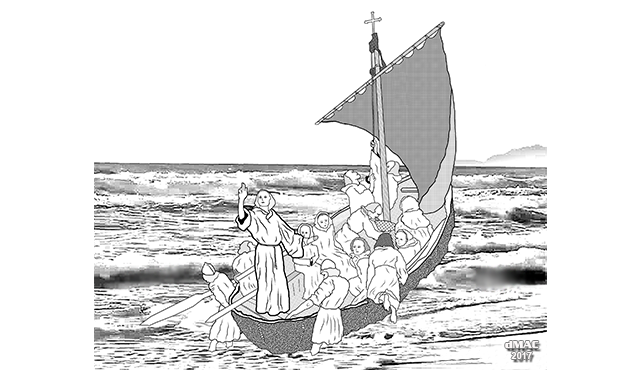 Saint Columba leaving Ireland with his 12 companions to establish Iona monastery in 563 CE. 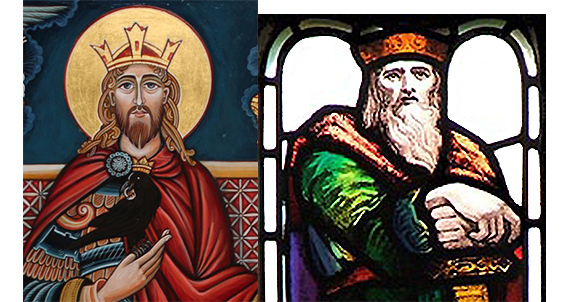 [L] King Oswald of Northumbria, with his pet raven [R] Oswald's younger brother, King Oswy. [L] Synod of Whitby 664: Bishop Coleman with his Celtic monks, Abbess Hilda and King Oswy, listen to Wilfred of Rippon deliver his presentation on behalf of the Church of Rome. [R] Later, Bishop Coleman was quiet and withdrawn. His beloved Celtic Church was to be no more. He resigned his see and travelled back to Iona. 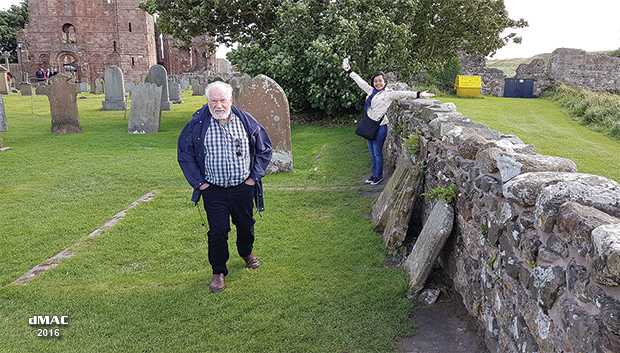 [L] Opening St Cuthbert's grave in 698 CE. (Cuthbert died in 687) The monks display their astonishment at finding his body miracuously undecayed. 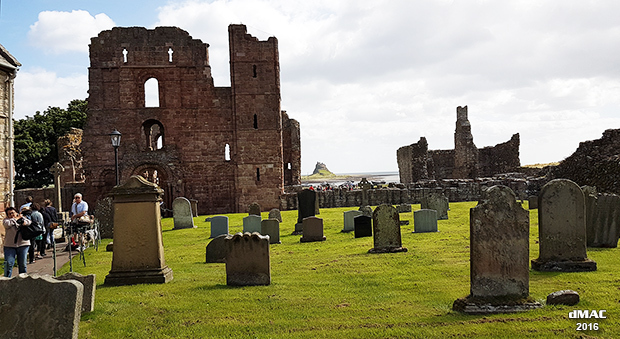 [R] St Cuthbert's relics returning to Lindisfarne in 1069. St Cuthbert's relics were moved from Lindisfarne in 875, eventually residing in Chester-le-Street (County Durham). They were moved a century later to Durham cathedral. In 1069 the relics were carried back accross the sands to Lindesfarne to escape the wrath of William the Conqueror. 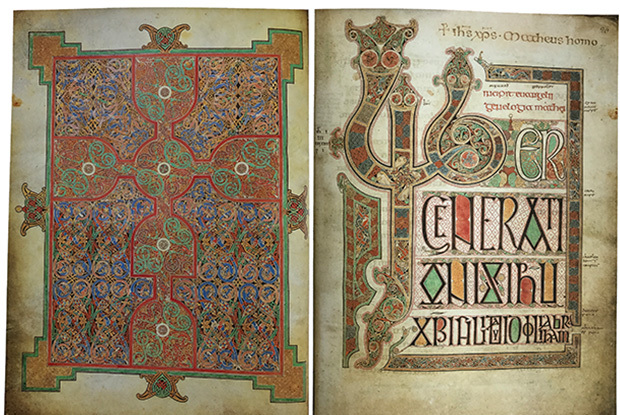 St Cuthbert Gospel retains its original binding and is the oldest intact European book. 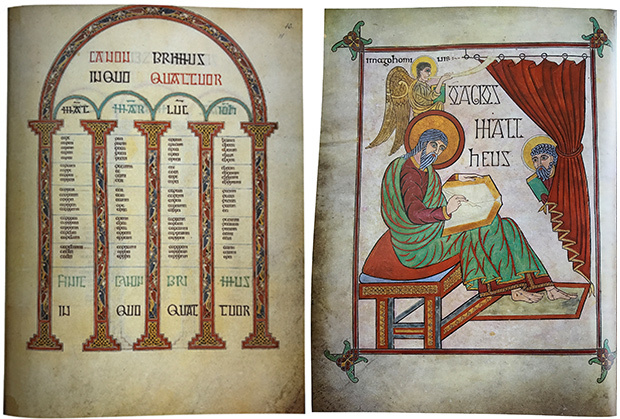 Made in the early 8th century(700 - 730 CE), it contains a copy of the Gospel of John. 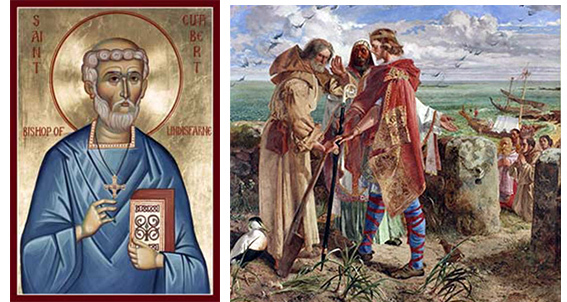 The Gospel is intimately connected with St Cuthbert. 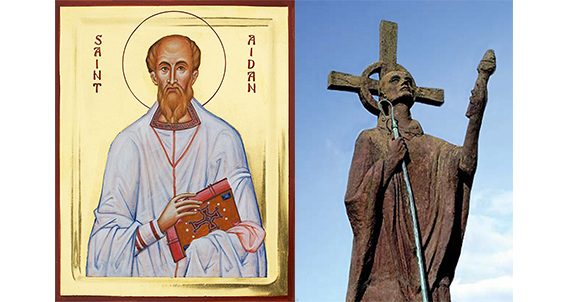 Cuthbert was re-interned at Lindisfarne in 698. 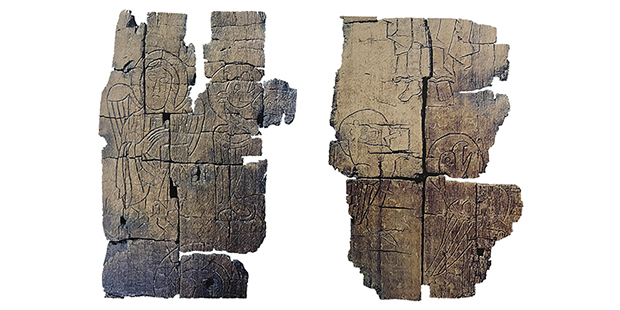 His coffin was removed following the second Vikings raid in 875. It was eventually taken to Durham, where it was opened in September 1104. Again his body was found to be uncorrupt, still flexible and smelling like a rose. The Gospel was discovered lying next to his head in pefect condition. 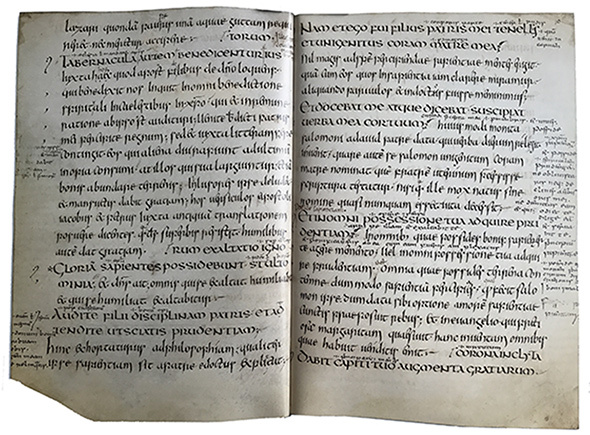 It was aparently produced at Wearmouth-Jarrow by a local scribe in the early 8th century. 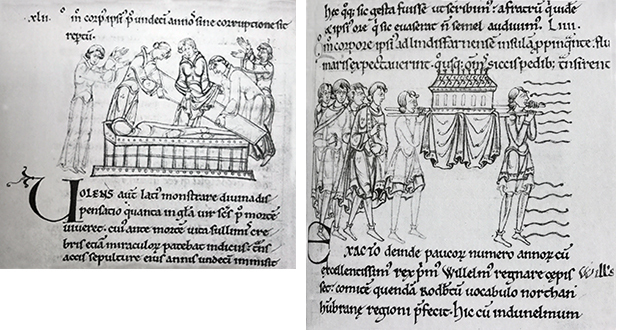 Cuthbert's body remained at Durham cathedral until 1537 when Henry VIII sent emissaries to loot and destroy the saint's tomb. They too found his body uncorrupt, but that didn't deter them from stealing the jewels and ornaments buried with him, including the gospel. The book, then over 850 years old, passed into private hands. In 1769 it was given to the English Jesuit College at Liege. The Jesuits brought it with them to England when the Leige college was moved and renamed Stonyhurst College. 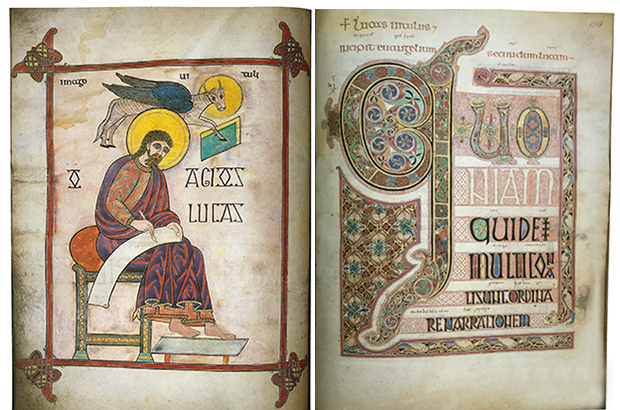 In 1979 the Society of Jesus loaned the gospel to the British Library, where it has been on display ever since. In 2011 the Jesuits decide to sell the pocket-sized book and use the funds to repair church buildings. The British Library raised the purchase price of 9 million pounds ($14.5 million). 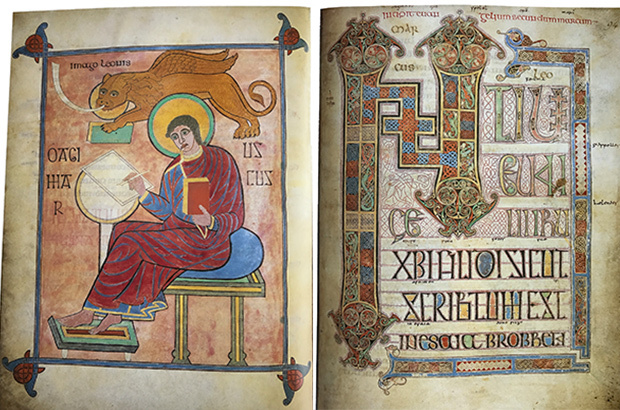 The gospel will be shared between the British Library and the Durham World Heritage Site. Durham is thrilled at the prospect of its homecoming. 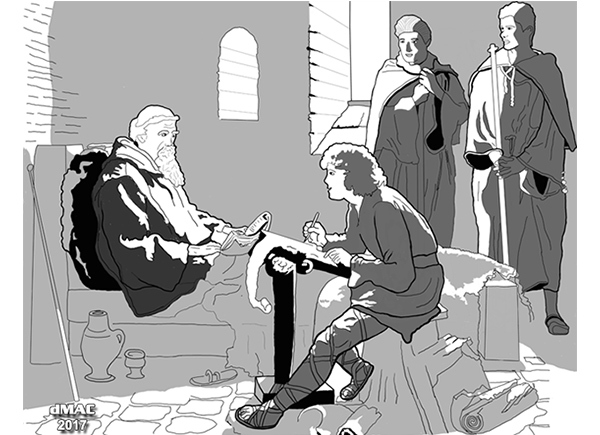 The Venerable Bede (673-735), dictating to a scribe at Jarrow monastery. 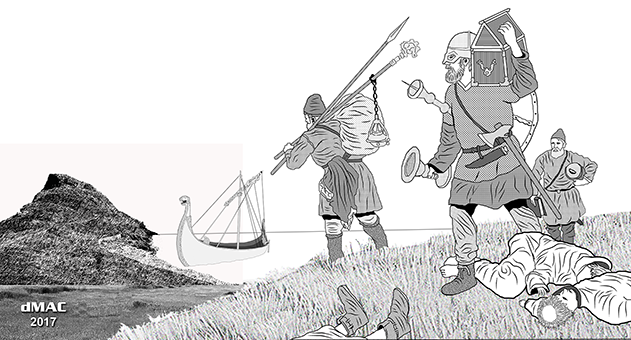 The Viking raid on the Lindisfarne Monastery on 8 June 793 caused great alarm throughout the Christian world. 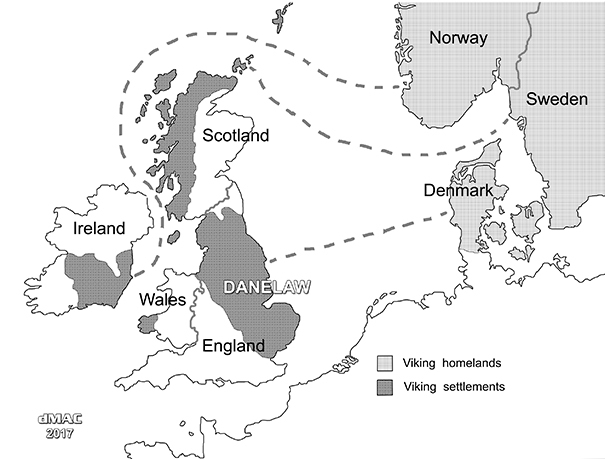 It is generally considered the beginning of the Viking Age. 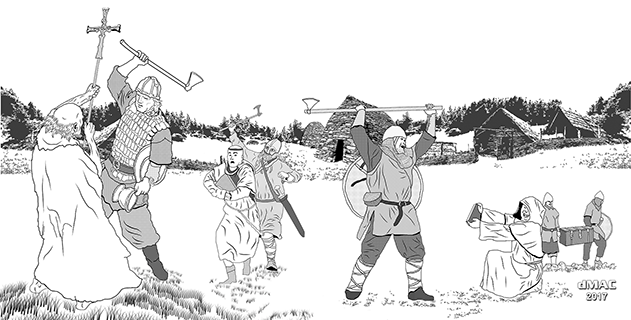 The Vikings realised the most lucrative targets were Monasteries, which were undefended and contained much plunder. 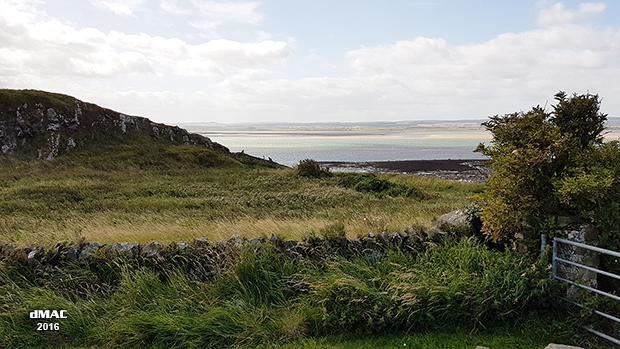 Monks in Lindisfarne, Iona and other British and Irish monasteries were forced to relocate their valuable documents and treasure to more inland locations. Even this failed to protect them over the next 200 years from the predators. This Digest volume can be downloaded as an e-book on Smashwords.